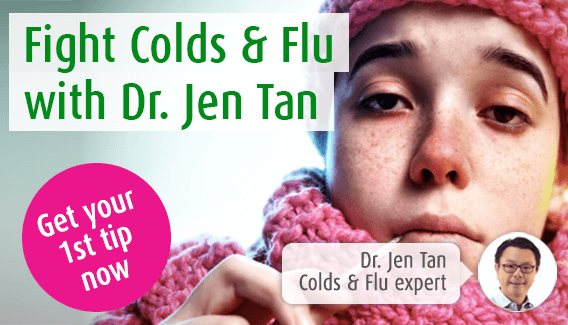 The period after a flu virus can be challenging as you try your best to get back to full health. To help speed this up I’ve listed my top tips for post-flu recovery. Here I explain that what you eat can play a big part in how you feel at this time, plus I offer some advice on when to return to everyday activities like exercise and work. How long are you contagious when you have the flu? As I’m sure we all know, viruses are passed through the air via coughs and sneezes however, touch also allows for the spread of germs.1 We are infectious for around 3-7 days after our first contact with a virus, though symptoms generally last much longer than this. How many days does it take to recover from the flu? The flu, which is caused by contact with a virus, usually lasts between 7-10 days. It causes symptoms similar to the common cold such as coughing, headaches, fever and aches and pains. It may also result in fatigue which can take a little longer to recover from. If this combination of symptoms persists much longer than 10 days then I’d recommend you get a quick health check from your doctor. How can I boost my immune system after a virus? In order to tackle a flu virus and help prevent further infection the immune system must be in good shape. As I discuss below, we can boost our immune system using our diet however, the Echinacea plant can also bring support. Our Echinaforce Echinacea Drops help to strengthen the immune system but may also be used to fight the misery of a current bout of cold or flu. It can be taken at the first sign of infection to help speed up recovery or longer term to support the immune system more generally. What should you eat and drink when recovering from the flu? Fresh produce is the best option if you are recovering from a bout of flu as, unlike processed goods, these are rich in natural vitamins and minerals. Fruit such as oranges, strawberries and kiwi, for example, contain lots of vitamin C which supports the immune system and, in doing so, speeds up recovery. Vitamin C stores can also decline when the body is exposed to a virus and so again, loading up on foods rich in it will aid recovery. Garlic is another immune-boosting food as it contains antioxidants and anti-microbial properties that help to defend against infection. We can’t really munch on this ingredient as we would an orange, kiwi or strawberry though, so as an alternative you could try a supplement such as our Swiss Garlic Capsules. With an abundance of blueberries, which contain that all-important vitamin C, our blueberry and oatmeal smoothie is ideal in the post-flu period. This particular smoothie makes a healthy and filling breakfast, plus it tastes great! Alongside this, it also contains immune-boosting vitamin B, as well as lots of antioxidants. As you get over flu symptoms though, a smoothie isn’t the only beneficial drink. As it is an excellent source of magnesium, zinc, calcium, potassium and vitamin D, our Balance Mineral Drink may also be helpful at this time. This combination of ingredients helps to reduce fatigue and tiredness which can continue long after other flu symptoms have eased. Pour one sachet of Balance Mineral Drink into a glass containing 150ml of water or milk and then stir well. The drink has a natural strawberry flavour so is both refreshing and tasty! Read what other people are saying about Balance Mineral Drink. How long should I wait to exercise after flu? Exercising whilst you have the flu is not advisable as the body needs time to recover which it simply can’t get if you’re in the gym for an hour each day. On top of this, exercising when you’re ill risks making symptoms more severe and, whether you are in a running club or play badminton once a week, you risk making your sporting companions ill if you participate with the flu. I’d recommend you don’t return to sport until a week after your flu symptoms have eased. This will ensure you have given your body the space it needs to recover, plus when you do go back you’ll be in top form! When should I return to work after flu? In the initial stages of infection flu symptoms can be quite severe. If this is the case it is best to take some time off work to allow your body to recover and if this isn’t possible then, at the very least, request to work from home. At this time you may still be infectious, not to mention the fact that you’ll probably disrupt the work of your colleagues with coughing, so this gives further justification for staying in bed! The temptation is to return to work as quickly as possible to minimise disruption however, in the long run this is only likely to make you feel worse. How long you take off will depend on how severe your symptoms are but generally, they should go away after about 5 days and at this point you should be able to return to work comfortably. Our top post-flu recovery tips! Looking for help to reduce feelings of fatigue and tiredness? Need help regulating and balancing your pH? Then look no further than Balance Mineral Drink! To find local independent stores in your area that sell Balance Mineral Drink, simply type your postcode below. Is it really the flu? Our quick quiz helps you figure out if you really do have the flu, or just a nasty cold. I’m the Immune System expert here at A.Vogel, and if you’re looking for flu treatment, I recommend Echinaforce® and Echinaforce® Hot Drink. The flu vaccine won't protect you against all the flu viruses lurking around. It may help prevent a few, but not them all!